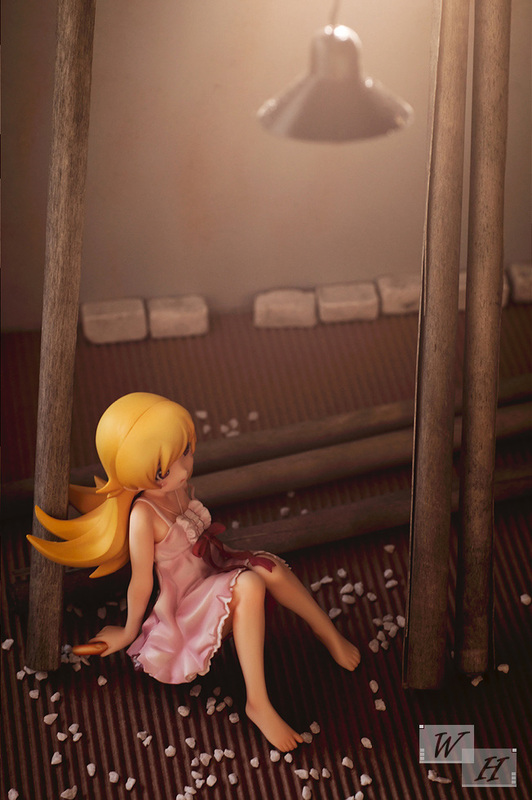 Bakemonogatari was well received by the audience and manufacturer GSC turned all of the 6 heroines of the show into 1/8 scaled figures, they were all based on the Blu Ray/DVD front cover illustrations. Other Companies like Kotobukiya or ALTER also made nice figures of that franchise, but from my impression Good Smile Company offered the better looking figures, overall. I was tempted to buy the figure of Kanbaru, but I was doomed by the sold out tag, actually I wanted to wait for a price discount. Unfortunately that never happened. 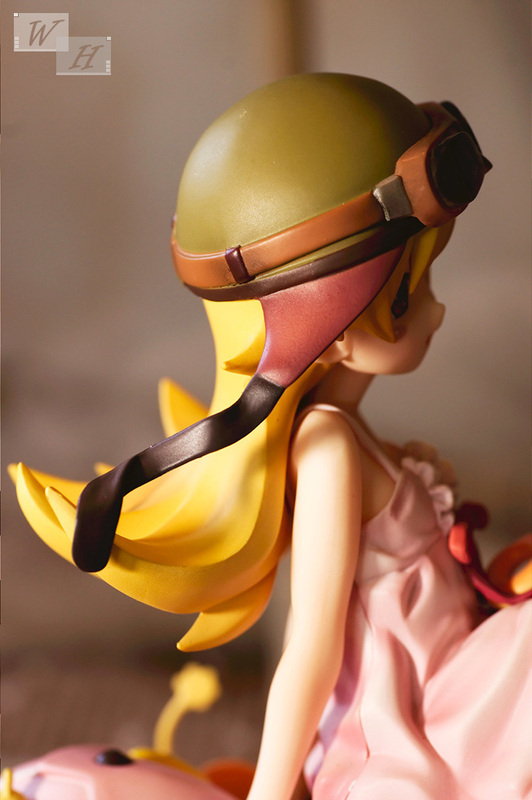 A few more months ago a prototype of Shinobu was shown at Wonderfestival. 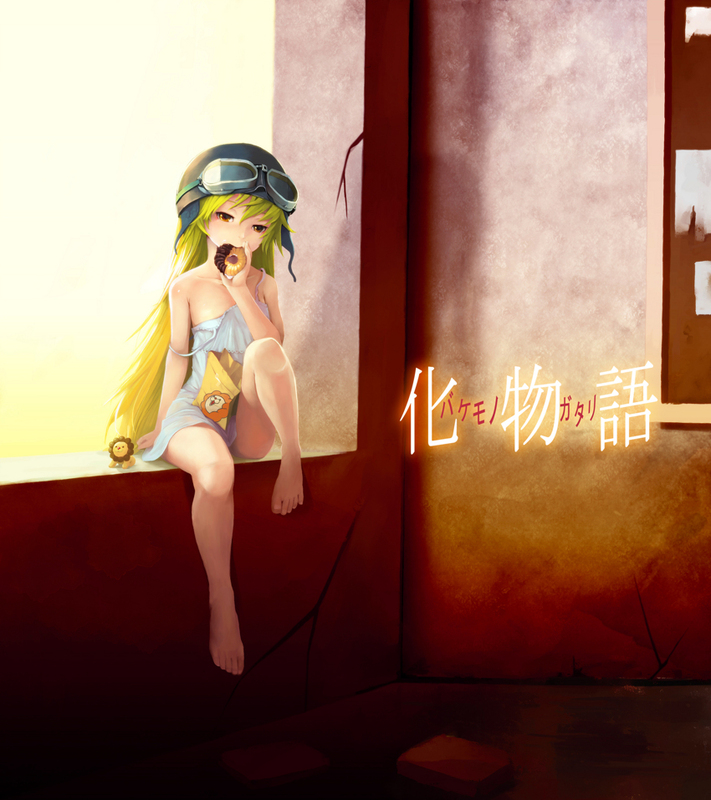 I really liked the cute appearance of her sitting on a donut pile with a motorcycle helmet. I waited for pre orders being opened, her price was quite good and I better not wait for the sold out curse. For this shooting I wanted to recreate something like in this illustration and did some arts and crafts, I bought a cheap medium density fiberboard and cutted out an rectangular shape, I used some adhesive tape to cover the holes in the board and sprayed everything with grey to get the run- down cram school look, the other props were already in my posession so I was good to go. I wanted to test my newly aquired wireless PixelKing TTL flash trigger and so I didn’t use my 60×40 softbox lamp this time, instead of that I’ve used a combination of natural light, my now wireless external flash and my little automatic slave flash. It worked surprisingly well for a noob. 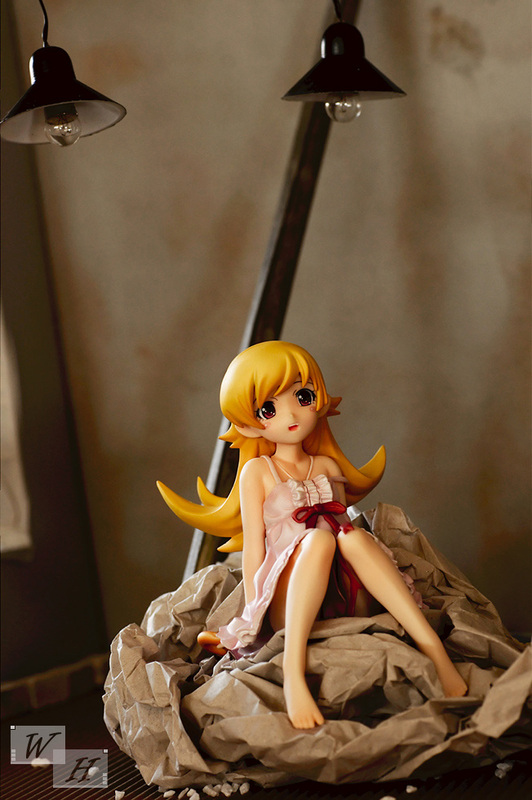 Anyway in Bakemonogatari, Shinobu is a cute little vampire girl, she was a grown up vampire lady before, but she was somehow turned into a small girl, the story about the true reason behind it will be revealed in Kizumonogatari. Being turned into loli might be a reason for her mainly gloomy and bored appearance in Bakemonogatari, she didn’t even talk in any episode. The reason for buying this figure was actually based on the design than my liking towards the character. In the Nisemonogatari adaption of the Monogatari novels, it seems Shinobu got used to her new self and cheered up, it was a big surprise as she started talking, she’s naughty, but enchanting at the same time. 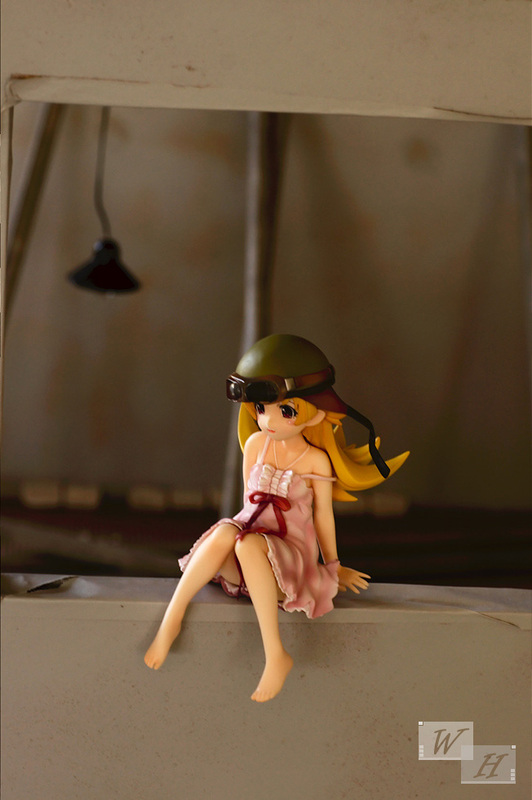 I hope GSC will make a figure of her like this in the future as well. On top she is wearing this great vintage helmet with cool brown straps and a goggle part, painting and shading on it are top notch, as little extra you can take it off. Beneath you see her long blonde hair, the tips have a interesting comic banana look, the strands and bangs in her face are clean and detailed and show some sublime orange shading. 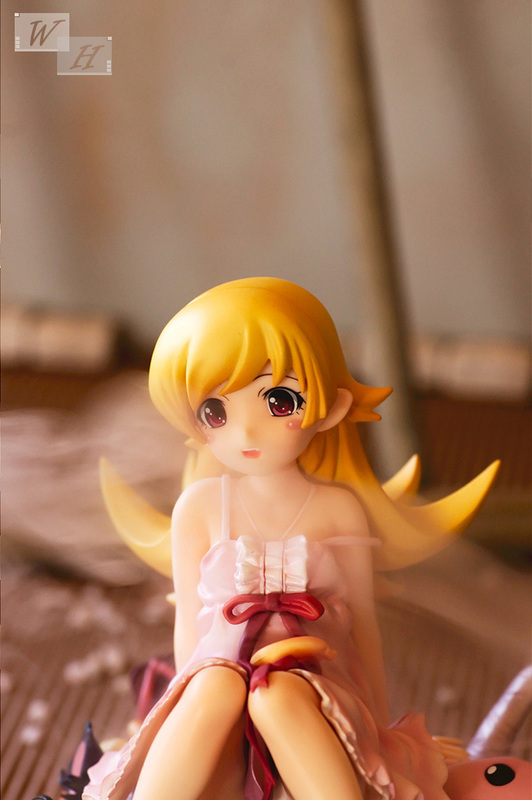 The face of Shinobu turned out very nice it’s really cute how her eyebrows shine through her bangs. She also has beautiful detailed eyes, BUT the fact that the figure is based on the Blu Ray DVD front cover illustration she differs to her appearance in the anime. The eyes are red instead of a gold yellow tone. In the anime they gold/yellow all the time, I’ve checked this to be sure. 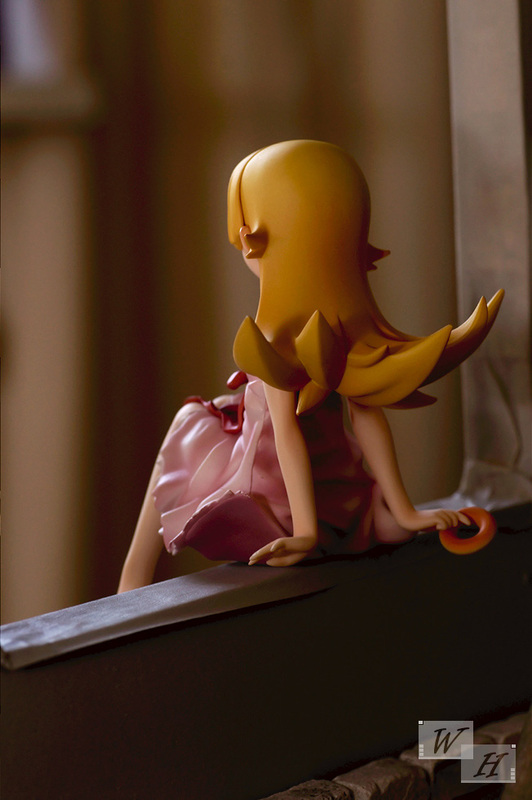 As to be expected from a 1/8 scaled loli figure, Shinobu is small if not even tiny, but she’s very detailed nevertheless, the little toes and fingers have sculpted nails. In the right hand she is holding a donut, which can be turned a bit in her hand. Her pose is also very well done with her arms placed backwards and the bent legs sitting, she looks good from many angles. Hahaha you are probably wondering where I hid the pictures with Shinobu and her base, but rest assured there is also a base included and some pics are below this block. As I’ve mentioned earlier the base is a pile of donuts on close view the shading on it looks a bit blurry, somehow like donut mud, but overall it looks good. 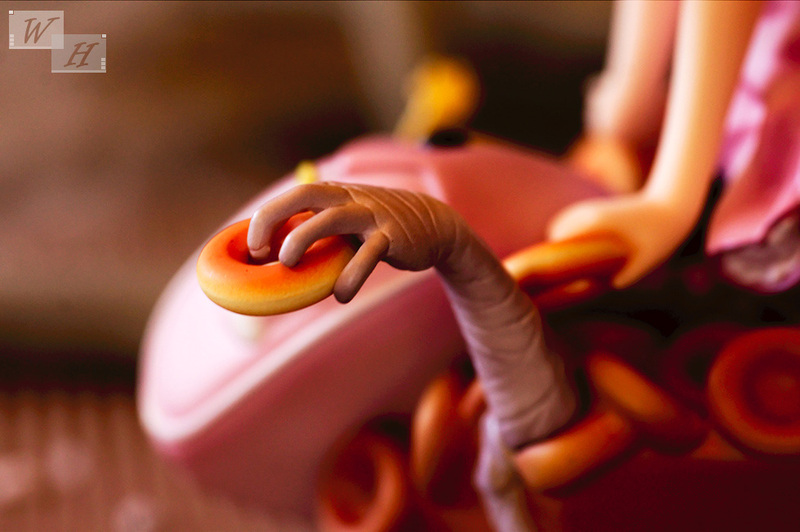 As last figure from the Bakemonogatari anime (I doubt that GSC will ever make a Araragi figure, unfortunately) it is very fitting that traits of all the characters are incorporated next to the donuts. There is Araragi‘s hair with a stapler at his ahoge and the fried egg hairclips from his sisters, Hanekawa‘s cat ears and glasses, the bandage arm of Kanbaru, Hachikuji’s backpack and Oshino‘s shoe , but I can’t remember the yellow flower? 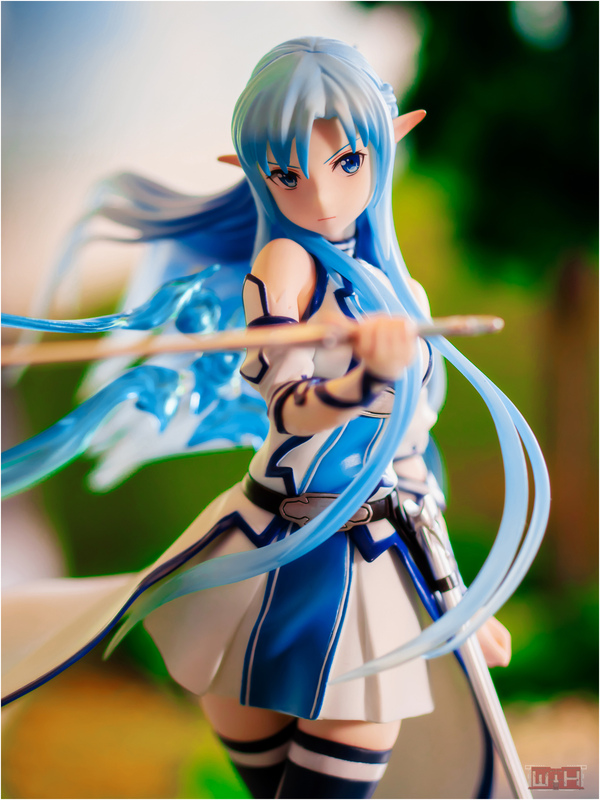 Well, what should I say, I think I never had so much fun with photographing a figure from Good Smile Company before, ok I don’t own that many figures from them to tell you the truth, but anyway this was a convincing figure for me and I’m very satisfied with the final product. 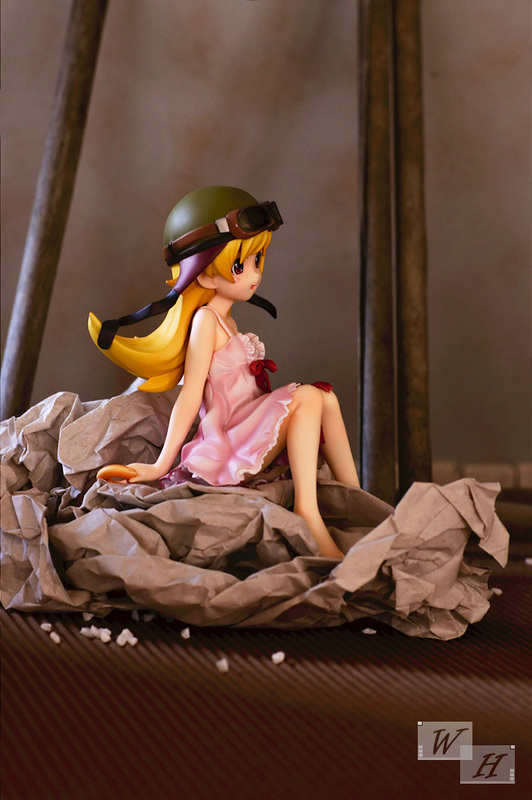 Shinobu is a great figure in a cute yet cool looking dress, everything on her is done in a very detailed way. The base has an interesting design and the opportunity to display her in different places, without her base is a nice gimmick as well as the helmet and donut in her mouth which can be taken off. 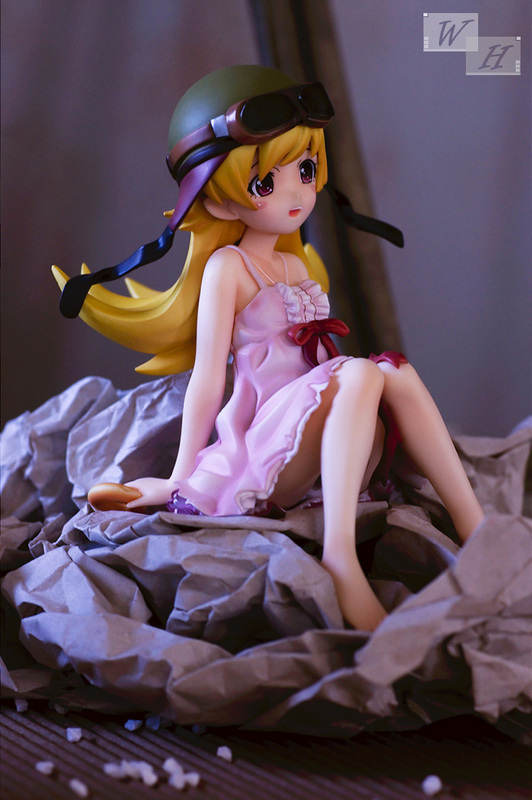 At first I only bought her for the cute and interesting design, but after watching Nisemonogatari I even found a liking to her character, which increases the value of the figure for me in this case. Hi and thx a lot, I’ve put some more thoughts into it than usual and it paid off. Yeah she’s a wonderful figure and her base is a nice plus. Fabienne, you’ve got a nice reconstructed scene there. There is only one word for you. “Wow!” 😀 Your creativity has really boosted a lot huh. Also… I’ve not watched it.. Oh no! I’m weird! …. LOL! Ahaha it was convenient that I had the right idea at the right, shooting this cute figure in front of a white background wasn’t what I wanted. 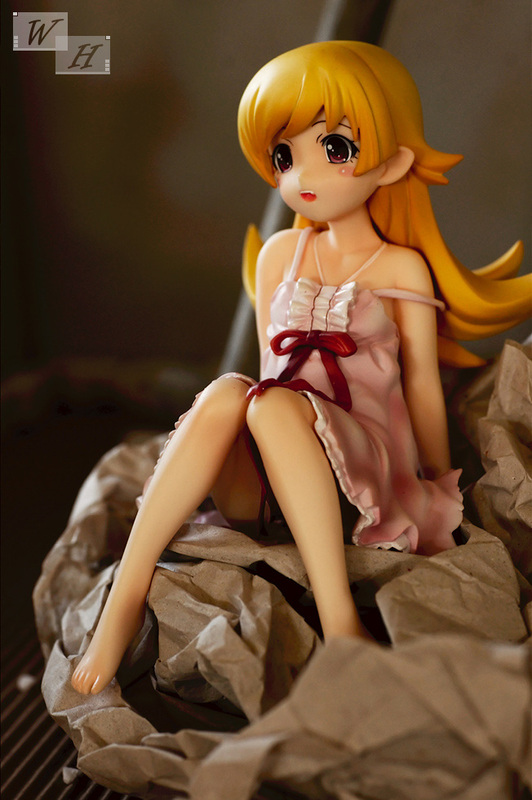 I bought Shinobu for the cute design too, but I ended up liking her quite a bit in Nisemonogatari. Mine came with a bit of discolouration on her shoulder so I was a bit disappointed with that. Otherwise, I love this figure. 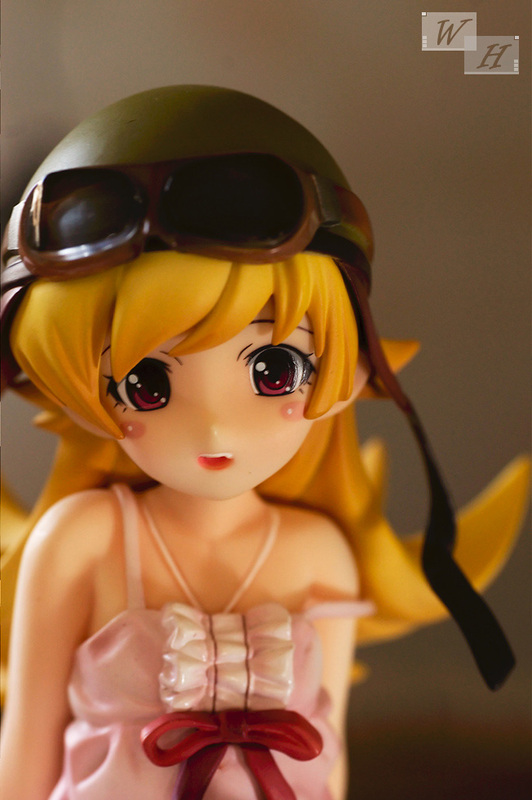 Definitely a good choice ^^ She was so cool In Nisemonogatari and adorable on top of that. Ah thats bad luck, sometimes these things happen in mass production, what color is at the shoulder?